Chicken Curry. Photo by Donna Turner Ruhlman. Blake works very hard, both as a writer (he has not one, but two new books coming out, a memoir and a biography of Charles Jackson), and as a teacher at Old Dominion University. His wife, a psychologist, works as well. They have a young daughter, and provided they aren’t flooded out of their home in Virginia and their generator is working (weather tends to follow him—read his Slate stories on being a Katrina victim), one of them will be charged with putting dinner on the table tonight. Both he and Mary want their meal to be as delicious as possible. Contrary to what the eminent cook and publisher recently told a writer for the New York Times, cooking doesn’t have to be difficult and exacting. It just takes a little planning. For this recipe, the planning involves upending a package of boneless, skinless chicken thighs onto a sheet pan and roasting them at 425°F for 30 minutes. This can be done the day before, or even 2 or 3 days before, or the day of while you’re reading the newspaper and bundling the young bear off to school. Or when you get home from work. Then simply cut up an onion and carrot and sauté them till tender. While they’re sautéing, get out some curry powder, turmeric, and cayenne, and cut the meat into bite-size pieces. Put them all together in a pot, add 2½ cups of water, bring to a simmer, and cook for 20 minutes. While it’s simmering, make some basmati rice and steam some green beans or nuke some frozen peas. If you want, thicken the curry with cornstarch at the end, and you’re good to go. If you’ve had the forethought to buy some cilantro, that adds flavor and color. I had leftover scallions last night, so I used those instead. 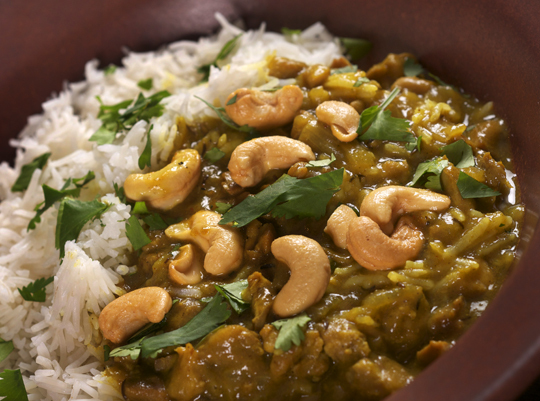 I love cashews on my curry, but they’re not necessary. What makes this good? Chicken thighs. They have some fat on them; they’re well-used muscles and so are tasty once they’re tenderized by cooking and cutting. High-quality curry powder (must post about making your own one day, but for now, just make sure it wasn’t purchased 5 years ago). And water (please don’t be tempted to use canned or boxed chicken “broth”—you’ll ruin the clean flavors), the great flavor extractor and melder. That’s it. Want to kick it up a notch? Make white wine part of the 2½ cups of water you add. Brown 2 tablespoons of butter, then add to it 1 tablespoon each of minced ginger and garlic and stir that into the curry at the last minute. But again, if it’s been a long day: onions, carrots, spices, chicken, water, done. Dump the chicken thighs onto a foil-covered sheet tray, and roast in a 425°F/218°C oven for 30 minutes. This can be done up to 3 days before serving. In a medium saucepan over medium heat, heat the oil and add the onion and carrot. Add a 4-finger pinch of salt, about a teaspoon. Cook until tender, about 5 minutes (the longer you cook the onion, the more flavorful the sauce). Clear away a spot in the pan, add the curry powder, turmeric, and cayenne to the bare spot, and toast the seasonings for about 30 seconds. Then stir to coat the vegetables. Cut the chicken into bite-size pieces and add them to the pan. Add 2½ cups of water and bring the curry to a simmer, lower the heat, and cook for at least 20 minutes and up to 30 minutes (then serve, or cover and keep warm till ready to serve). If you want to thicken the curry, stir the cornstarch into 2 tablespoons of water and add the slurry to the sauce, slowly, until it reaches the thickness you want. Serves 4 easily, even 6 depending on sides. Note: This technique of pre-roasting chicken thighs can be turned into a chicken bolognese by omitting curry and using pureed tomatoes for the liquid along with a bay leaf and oregano; or an Asian stir-fry by starting the dish with scallions, ginger, and garlic, adding 2 tablespoons hoisin, 1 tablespoon chili paste with garlic, and soy sauce, followed by the chicken and enough water to make a sauce. It’s infinitely variable. My recent post on making Indian pappadams. Try baking a loaf of Monica Bhide’s curry leaf bread. Check out Chef Suvir Saran’s Indian recipes and cookbooks. Make an Indian-style fried rice with paneer (Indian cheese) from the Yummy Tummy. Yes, that’s any easy dish to cook after a long day at work. A rice cooker is an essential appliance in my kitchen. Just curious – why do you roast the chicken beforehand? I thought the chicken will exude more flavor and taste in the final curry if it wasn’t pre-cooked, but allowed to simmer in the water. Thanks! I roast the chicken for three reasons. One, the browning, which makes the chicken more flavorful. Two, pre-cooking sets the proteins so the chicken doesn’t releases a lot of scum into the sauce (though you could accomplish this by adding them to the pot before the liquid). Three, they’re super easy to cut this way. So mainly because it’s easier, and adds flavor. So why don’t you cut up the chicken and brown it in the pan before the onions? You’d get much more browning, it would be faster, and you wouldn’t use an extra sheet pan. Cutting up boneless thighs is not as hard as you seem to think it is. Why roast the chicken? Caramelization. The high heat combined with the sugars that rise to the surface of the chicken create the Maillard reaction, which creates upwards of 500 different flavor compounds. Poaching the chicken can’t do that. I’m not a stickler on the caramelization maillard distinction, though it’s useful to know the distinction. Caramelization is the browning of sugar, and maillard is the browning of protein (be it chicken, or a loaf of bread). someone correct me if I’ve over simplified or gotten it wrong. Thanks for the recipe and the link to the Christopher Kimball article. I enjoy his show on PBS and occasionally pick up the magazine, although I’m not much for strict adherence to recipes. I like Kimball despite his prickly personality and oddball mannerisms, but I think he does a disservice to home cooks with some of his quotes. In the big picture, I think you and Kimball have the same goal: to get more Americans cooking and enjoying most of their food at home. The big difference is that you are much more generous in your assessment of the home cook’s potential to learn and create. Kimball is right in once sense – blind and dogged adherence to recipes is hard work and is not creative, but someone had to use their creativity in the first place to come up with those ah-ha moments that take recipes from good to great. Creativity can only shine its brightest when it is backed by education, which is what you advocate and provide in your books and web site. There’s no reason why home cooks can’t have the same experiences as the test kitchen chefs, only our experiences are joyful because we’re doing it with the goal of providing quality and pleasure for ourselves and our families, rather than for a paycheck or to impress the boss. I have made myself (and ordered in) a lot of various curries over the last year. My shift work schedule makes post-work time very valuable during my work day rotation because I don’t like to eat too close to when I go to bed. Your method is a pretty similar to my routine weekly curry, though I always add a large knob of fresh grated ginger and 4-5 cloves of minced garlic as well as my own spice blend (which relies heavily on paprika). What’s nice is that by increasing the volume of your onion, carrot and other non-meat ingredients just a bit you can make a really easy, stable, curry base to last 3-5 days; with minor alterations you can have a different dish each night. This is pretty much how the take out curry joints offer 20 different curries on their menus! I prefer coconut milk and don’t thicken with corn starch. After that just change your protein (I switch between lamb, chicken thighs, salmon, shrimp), I sometimes forego the protein altogether and use only vegetables. Reheating, blending to change texture, all that can be done in less than 15 minutes after your 40 minute (if that!) investment on the first night. Adding a bit of coconut milk would take this to another level. Try adding a ripe mashed banana too. Secret of many good curries. Ripe mashed banana? I would never have guessed, but now my mouth is watering. I bet it is delicious with the coconut milk, too. Thanks, Earl.